Christians, biblical creationists, people with a Conservative bent, pro-life supporters, those of us who believe that marriage was established as between one man and one woman — Facebook detests us. Not surprising, since it's appallingly leftist and atheistic. You know the old saying, "A fish stinks from the head down", and that fits Fazebook. 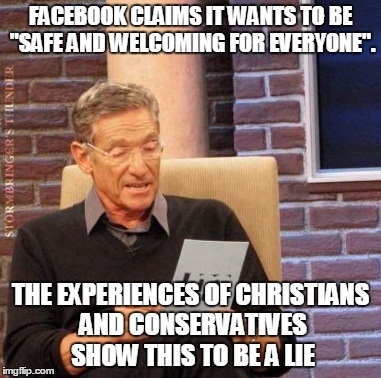 They say that they want people to feel safe and feel welcome, but that's a lie, plain and simple. Linked below is a parody. It was assembled from real incidents, but the reports were modified with made-up names. Still, this is how it feels for those of us who indulge in real hate speech and bigotry that Bookface approves, but are recipients of strong action when we promote our own values. For the parody image, click here.